I haven’t made sourdough in quite a while, so I started re-energising my starter Thursday night and finally baked this boule today. I love returning to sourdough because it’s always quite pleasant, even a bit of a rush, to find that I haven’t lost my touch – or my starter, for that matter. It’s been about ten years now since my boss – two bosses ago, that is – brought me a pint of live sourdough starter dough from a San Francisco bakery on his return from a California trip. It’s hardy stuff. It survived its initial mistreatment in the cold baggage hold of an airliner, where it burst its plastic container but was held by the first of two layers of freezer bags, and seems to laugh off my periodic neglect, when I’ve forgotten the starter’s in the back of the fridge and didn’t feed it for a month. Or two. Or…well, never you mind how many months it was that one year. As you can see, Lactobacillus sanfranciscensis and Candida humilis have both forgiven me, and that’s all that really matters. We three get along just fine. 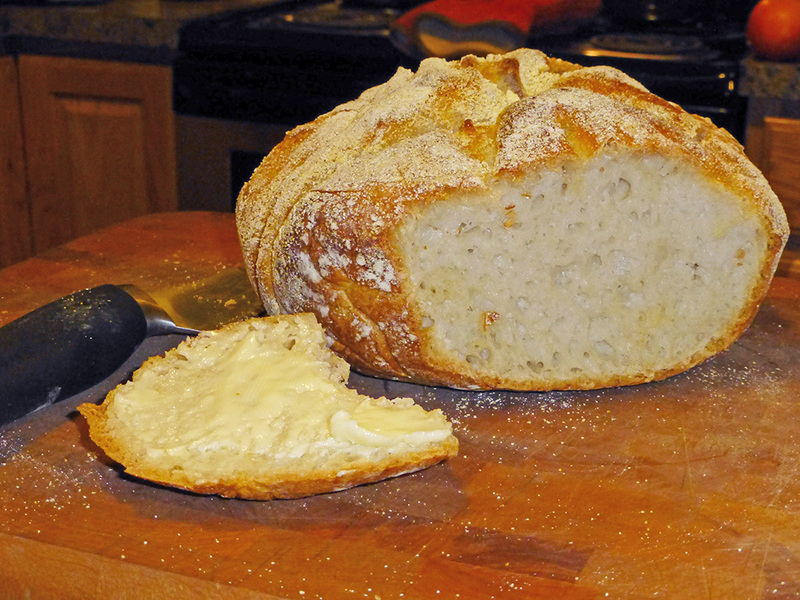 This entry was posted in Baking and tagged boule, Candida humilis, Lactobacillus sanfransiscensis, sourdough. Really Super Beautiful ! We made brioche Friday. I’m not much of a bread maker but the results are so wonderful it seems worth the effort. “From The Inquisitive Cook, by Anne Gardiner and Sue Wilson with the Exploratorium (Henry Holt and Co., 1998). Surface temperature of a browning crust. Interior temperature of a loaf of just-baked bread. Yeast cells die (thermal death point). Water temperature for activating yeast designed to be mixed with the dry ingredients in a recipe. Temperature of water for dry yeast reconstituted with water and sugar. or lower When yeast is mixed with water at too low a temperature, an amino acid called glutathione leaks from the cell walls, making doughs sticky and hard to handle. Temperature for liquids used to dissolve compressed yeasts. Optimum temperature range for yeast to grow and reproduce at dough fermentation stage. Recommended water temperature for bread machines. The thing that has gotten me most of the time is the water not being hot enough. And learning that could cause the dough to be sticky was a real help ! Cause then you think you should compensate and add more flour and that screws things up even more. but you obviously don’t have that problem ! That mie is superb Lalo ! Worth photographing up close ! Bet it was tasty too. Yup, quite tasty, whether still warm from the oven, room temperature, or toasted, and with a beautifully crunchy-crackly crust no matter what temperature. I would disagree with two of the temperatures in that list, but only slightly. I think the yeast terminal temperature of 130-140F/55-60C is likely referring to commercial yeast, bred to be resilient in a wide range of conditions. If I recall correctly, the highest safe temperature for wild yeast like that in my sourdough starter is 115F/46C. I use Poland Spring water from the 2.5 gallon dispenser in my fridge – municipal water chlorination can kill Lactobacillus, so I play it safe – and warm it with the microwave to 110F/43C. Keeping the fridge at 40F/4C seems to be dancing a little close to the danger zone of 40-140F/4-60C. Who has a fridge thermometer accurate enough that they can practically dip their big toe in the bacteria pool like that? I keep my fridge at 34-36F/1-2C. Those few degrees also have the effect of increasing the fridge life of perishables by a fair amount. One frequently heard bread theory that bugs me is the one that states you should put salt and yeast into the flour at opposite sides of the mixing bowl because the salt will retard the yeast. The ones who posit this theory then pour the water in and immediately proceed to mix them all together to form the dough. Huh? So five seconds of keeping the dry yeast and salt separate before you mix them with water makes a detectable difference? I have a crisp new one dollar bill right here that I’ll gladly hand over to anyone who proves that to my satisfaction. link to recipe for you boule? I use a variation of the no-knead method published in the New York Times – see the article below and the links within. Because I use a fed sourdough starter, which has a pace all its own, the times are fairly different, but the basics are the same, as is the baking in a pre-heated and covered enameled cast iron Dutch oven. I have a 3.5-quart one that facilitates the higher loaf you see above. No-knead loaves done in a 5-quart Dutch oven tend to be a couple inches flatter. 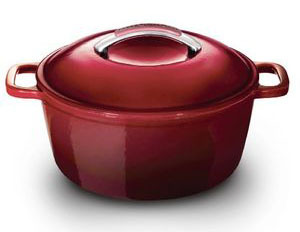 This is my 3.5 quart Dutch oven – unfortunately discontinued by KitchenAid some years ago.